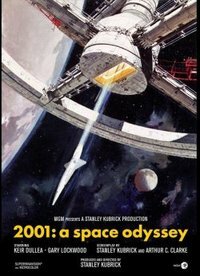 Stanley Kubrick's 1968 mind-bender 2001: A Space Odyssey looms like a monolith not just over science fiction films, but over cinema in general. I caught a screening at the American Cinematheque's 70mm film festival last month. In a word: wow. I've seen this movie several times but always on the small screen. The first time was in the early 1970s. I was 8 or 9 and laid up with a serious case of the flu. My parents knew I liked spaceships (stacks of comics and toys attested to this), so to lessen my misery, I was laid out like a dead Viking warrior on the living room couch. My feverish head propped on a pillow, I was fed chicken soup while this epic story unfolded on the 25-inch RCA television across the room. I remember watching apes jump around for nearly half an hour and wondering: um, where the heck are the spaceships? Then the monolith appeared, a sleek black oblong entity that did ... well, something to these apes, because soon one of them figured out how to use an animal bone as a weapon. And then they had fresh food. And then they could overtake a rival ape gang at the neighborhood watering hole. And then the bone got thrown into the air and became a spaceship, and the lilting "Blue Danube Waltz" kicked in ... and I was hooked. Actually, the right term might be infected. I'm sure that as Dave Bowman began his psychedelic trip through the stargate to an alien (yet eerily familiar) world, my fever spiked and I too was blinking and shaking at sights my young mind could barely comprehend. A couple of years later, I discovered a copy of Arthur C. Clarke's novelization in my school library. Which explained, like, a lot ... maybe too much, now that I think about it. And then Marvel Comics published Jack Kirby's oversized adaptation. The film has remained, for many, cinema's best take on what it might feel like to actually encounter an alien entity. Or God. Aliens abound in sci-fi. Often they're just reflections of ourselves, especially in TV and film. Take a decent actor, stick on some funny ears here, a little green skin there, and you've got your typical pop culture alien. It's a cost-effective way to add a little extraterrestrial exotica to a storyline. But the universe is a huge honking place. If you're in LA, check out the staggering planetarium show at Griffith Observatory, which whisks you from teeny tiny Earth to the farthest reaches of the galaxy we can see with our telescopes. There's a good chance that life exists somewhere out there. After all, there is a precedent we know about. But given how harsh things are, and how rare a planet like Earth is, there's little chance that other life forms will look or act familiar. And that's the utter genius of Kubrick and Clarke. Their alien is so damn alien it doesn't operate by our rules. It can only represent itself as a simple yet foreboding geometric shape. Are the monoliths the aliens themselves? Are they robots? What is their purpose? And just what happens to Dave Bowman at the film's climax? The questions themselves, let alone the many speculative answers, are almost beyond our comprehension. Kubrick liked to subvert audience expectations, and by the film's end, despite all the technological wonders and epic journeys, we're no smarter or more civilized than those screaming apes in the film's opening segment. Until last month, I'd never seen 2001 on a big screen and never in 70mm. This was a sell-out show and the Aero Theatre in Santa Monica turned away dozens of unhappy people. Before the screening, the manager asked how many people had already seen the film. About 75 percent of the audience had, with about a third having already seen it in 70mm. For me, and for many in the audience, it was like discovering a new film. I have to say that what struck me most were the actors' performances. 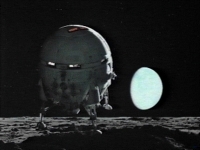 It's justly argued that there are no three-dimensional characters in the film, and that the only real emotion comes from the iconic computer HAL 9000. What you see in 70mm, in particular from actors William Sylvester and Keir Dullea, are controlled people keeping a tight lid on many things going on below the surface. There's a nice scene where Sylvester's Dr. Heywood Floyd has to evade questions from his Russian friends. America's moonbase has suddenly been quarantined and rumors are flying. There's a definite tension and even sadness that registers here. It hurts Floyd to openly lie to people he genuinely likes, and he knows they know he's lying. It's all right there between them, awkward and ugly and tense, yet everyone holds their true feelings below the surface. Sure, it's not major dramatic fireworks, but it is something I've never really picked up on before. Previously, I always found Dullea's doe-eyed performance likeable but a bit bland. I was stunned to see more going on in his face this time around. As mission commander Dave Bowman, who's taking the massive spaceship Discovery to Jupiter on a secret mission, Dullea does an admirable job as the quintessential all-American astronaut whose training barely, and I mean just barely, holds him together as things start going south. For the first time, I was reminded of Jim Lowell and the Apollo 13 astronauts, how they had to choke down fear and panic while plowing ahead with the tasks that would save their lives. The nuance in these performances came as a wonderful surprise because, as I'd expected, the cosmic spectacle of this story really overwhelmed me. The amazing effects (designed by the legendary Douglas Trumbull, probably the first tech film credit I really sat up and paid attention to), Kubrick's geometric frame composition, graceful editing, hypnotic pacing ... this is hands-down Kubrick's masterpiece and one of the greatest films ever made. The Aero manager hinted that, due to the popularity of the screening, they may schedule it again sometime in December. LA film buffs should keep their ears to the ground and snap up tickets ASAP, lest you end up bereft and grumpy on Montana Avenue. 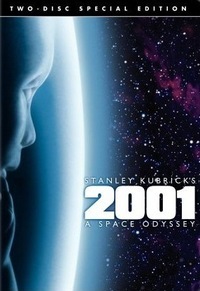 Next week we see another release of 2001 on DVD. From all reports, the prior two discs were less-than-optimal transfers and contained little in the way of extras. I'll certainly snap this one up ... but on even the best home theater, I know it will look positively puny in comparison to a 70mm theatrical exhibition. Over at Hollywood Elsewhere (where I posted a bit of the above), Jeffrey Wells predicts that this spring, on the film's 40th anniversary, we'll all have the chance to see 2001 in theaters again ... maybe even IMAX. Now that would be a mind-blower. Coming up later this week, I'll have another post on 2001 ... this one focusing on a very striking aspect of the film. It's taking a little more prep time than I'd planned, but stay tuned.